UK based Atom Bank has announced that its Chairman and Founder, Anthony Thomson, is to step down from his position with the company. The bank, of which BBVA owns a 29.5% share, has appointed Bridget Roswell to take his place as Chair – subject to regulatory approval. Thomson had been the Chairman of the mobile-app focussed bank since its inception in 2014, and oversaw the bank gaining a banking license and subsequently raising over £250 million. Atom, which has been one of the fastest growing start-up neo-banks in the UK, has since taken over £1 billion in deposits and lent more than £1 billion to small businesses and homeowners. Atom Bank’s success and status under Thomson’s chairmanship has been widely recognised, with the bank continuing to hold a top 10 position in KPMG´s global fintech rankings for each of the last three years. Commenting on his decision to retire, BBVA CEO Carlos Torres Vila, said: “Above all, businesses invest in people. Anthony’s vision and his ability to build great teams was fundamental in our decision to invest in and continue to support Atom Bank. We thank him for his exceptional leadership and contribution, and we wish him well into the future. Speaking of his decision, Anthony Thomson said: “Since having the idea for Atom Bank in early 2012 it has gone from being a big idea disguised as a small bank to a big idea and a big bank. Noting Thomson’s founding role in the creation and build of Atom Bank, Bridget Rosewell said: “It is thanks to Anthony’s vigour and dedication that Atom Bank is what it is today. “Anthony is the consumer’s champion, leading from the front to bring true competition to the industry and to change banking for good. It is with regret but also great admiration that the Board have accepted his resignation, and I and my colleagues fully understand his reasons for leaving having brought the business to maturity and achieved so much so quickly. 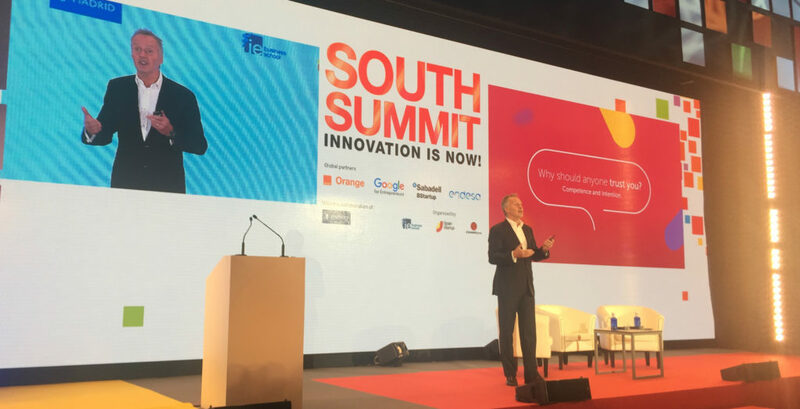 Anthony Thompson during South Summit event. Mark Mullen, Chief Executive Officer at Atom Bank said: “Without Anthony there would be no Atom Bank. His skill, experience and entrepreneurial drive have shaped and driven the business from its earliest incarnation. It has been my privilege to make this journey in his company and both I and the entire Atom Bank family owe him an immense debt of gratitude. After receiving a full banking license in June 2015, Atom Bank became UK’s first mobile-only bank. The bank is due to launch shortly in Great Britain, sometime during the first quarter of 2016. In this Bank NXT podcast, Atom Bank CEO Mark Mullen talks about user experience, the importance of mobile technology in the banking business and, ultimately, about the future of banking.